If your rental property investment goal is to reap a big profit when you sell, then understanding your potential taxes upfront is critical. Just knowing you’ll pay a tax on any gain you earn and the general tax rate is not enough preparation. You need to look at capital gains, depreciation recapture, net investment income tax, and short versus long-term gain tax rates to get to your real net profit number. The details can be found in the Internal Revenue Service (IRS) Publication 550, Section 4. For starters – if you sell a property within one year of purchase, the gain is taxable as ordinary income. The same rate you pay on your wages or net self-employment income. Selling a property after you’ve owned it for one year qualifies for long-term capital gain, with tax rates ranging from 0 to 20 percent depending on your income tax bracket. But you start by calculating a cost basis for the property — and that’s probably more than the purchase price. The Internal Revenue Service (IRS) allows you to add specific closing costs to the purchase price of a rental property, as it does with your residence. Some of these are sales tax, escrow fees, title insurance and recording fees, but mortgage-related costs are excluded. You can also add in any improvements you make to the property, as long as they have a useful life of more than one year and increase the value of the property. If you replace the roof, the heating system, or remodel a bathroom, for example, the cost adds to the properties’ basis. The IRS refers to this as the adjusted basis which can change over time if you make additional improvements to the property. If you acquired the rental property in another way, aside from buying it yourself, such as a gift or an inheritance, there are specific IRS guidelines for determining the basis. 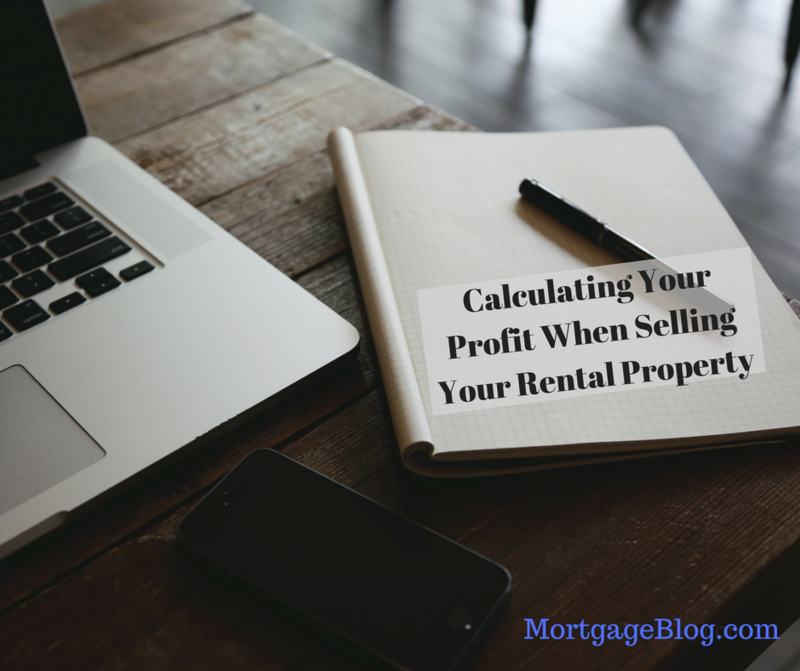 You’ll go through a similar adjustment calculation when you sell the property. Subtract certain selling expenses from the sales price, such as real estate commissions, and add anything of value you gain from the sale. Here’s an example to understand how these calculations work. You purchased a home as a rental property four years ago for $775,000. The deductible closing costs were $4500, and you replaced the roof and remodeled two bathrooms for a total of $38,000 in improvements. Your adjusted cost basis is $817,500. While you owned your rental property, you were entitled to depreciate the building and any improvements over 27 ½ years, or forty years depending on the schedule you use. Depreciation is a deduction rental property owners use to recover their costs. Based on the improved value of the property, net $125,000 in land value (which is not depreciable per IRS guidelines), and a 27.5-year schedule, you claimed $100,063 in depreciation expense over four years. Deducting this from the adjusted basis of $817,500 gives a net of $717,437. 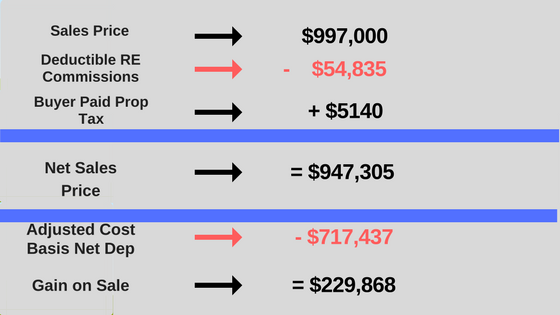 When you sell the property for $997,000, deduct the 5.5% in real estate commissions you pay, or $54,835. Also, the buyer pays your portion of the current property tax bill of $5140, at the closing, That makes adjusted sales price $947,305 and is used to calculate your gain on the sale. 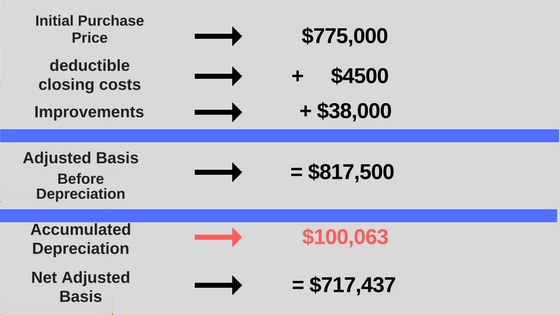 Your taxable gain on this is $229,868, or the difference between the adjusted cost basis, minus the depreciation expense and the net sales price. If you’re at a capital gains tax rate of 15%, the cost will be $34,480. But wait – there’s more! You’ll also pay Depreciation Recapture tax on the $100,063 of 25% – an additional $25,016. The total tax bill is now $59,496. And if your modified adjusted gross income is above $200,000 (single taxpayer) or $250,000 (married filing jointly), you will have to pay Net Investment Income tax (section 1411 of the Internal Revenue Code) of 3.8%. The property you sell and the property you receive must both be investment properties. The properties can’t be held to sell them to a customer (however it is ok to rent the property). The replacement property must be identified within 45 days of selling your property. The replacement property must be purchased within 180 days from selling your property. There are strict guidelines imposed by the IRS to qualify and execute a 1031 exchange, and failing to follow them to the letter will result in the potentially deferred taxes being due. To accurately estimate your potential capital gains, depreciation recapture and net investment income taxes, work with a CPA. Compare your options of the short and long-term capital gains tax or using a 1031 Exchange to defer the taxes on your real estate investment gains.